Davien Martinez meets Bruno | Pendragon Acres U.S. K-9, Inc. The 5-year-old Bradenton boy who was hit in the head by a stray bullet during a drive-by shooting last year is getting his wish. On Saturday, Davien Martinez met his new psychiatric service dog, Bruno. Bruno will help ease Davien’s journey with post-traumatic stress disorder and other disorders that came from the shooting. Martinez was home in bed nearly one year ago when he was hit by a stray bullet. The bullet traveled through his forehead and cheek, damaging the socket of his right eye. The shooting caused him to go blind in one eye. Dogs like Bruno typically cost $20,000 or more. 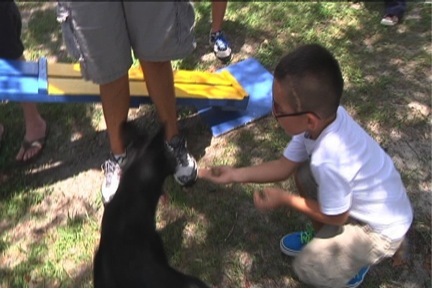 Fundraisers held by Tampa gun club and Pendragon Acres helped raise the money to purchase the dog. Bruno will go home with Davien in the next couple of weeks.